ROBERT Louis Stevenson’s Treasure Island is one of the earliest, and still greatest, of the pirate adventures, a genre that is now big business on film, in games and more. 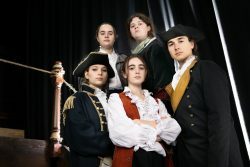 Ken Ludwig’s adaptation for the stage, chosen by Salisbury Studio Theatre’s youth group for the first production of 2019, sticks closely to the original, even retaining two Jack Hawkins’s – the narrator and the boy experiencing pirate shenanigans at first hand. Directed by Peter McAuley, with a solidly convincing set by Alistair Faulkner inventively lit by Tom Maskell, the whole thing is surrounded by BIG music, and the cinematic often wins over the theatrical. Many of the large cast of young actors struggle with getting their voices heard in the melee. 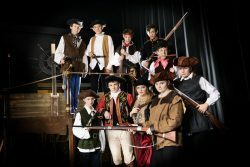 Voice production is really important in youth theatre, as some of the company – notably Luke Pullen’s multi-layered and charismatic Long John Silver, Maddy Ryalls’ memorable Ben Gunn and Hanna Butcher’s commanding Captain Smollet – resoundingly prove. 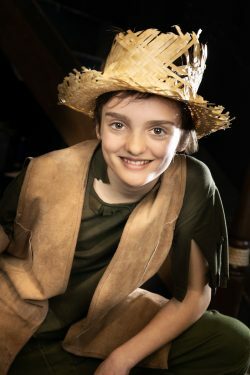 Alice Walters is a charming young Jim, with Phillipp Nikolin as the older hero looking back on his adventurous life hunting for treasure on a paradise island. The show continues at Studio Theatre in Ashley Road until 26th January. Posted in Reviews on 22 January, 2019 .